I froze in my tracks, looking all around me. 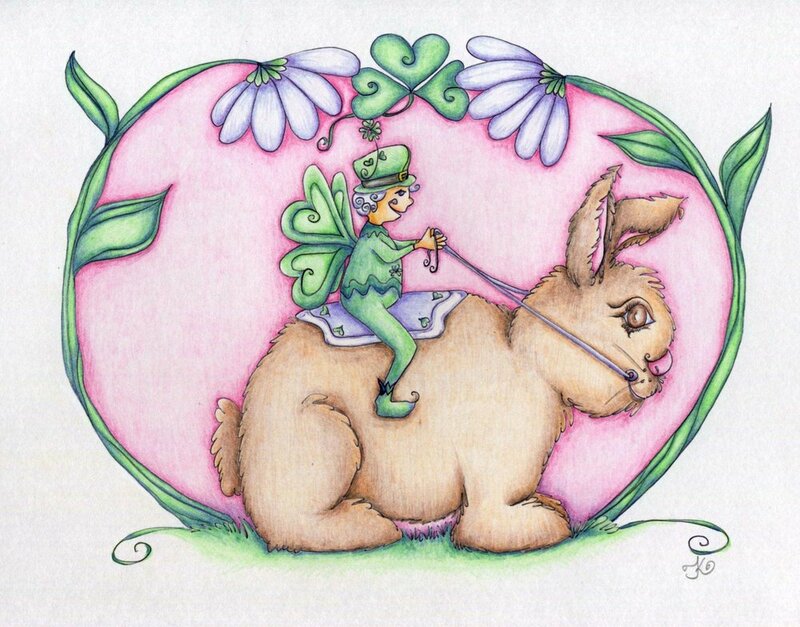 Then hopping out from the flower bed, I spied a small fluffy brown bunny and riding on its back was a little fairy. They were so adorable! “Oh, I’m sorry! I didn’t see you there.” I said. “I’m glad you saw me too! I would have felt horrible if I had stepped on you. I was looking at those lovely white flowers with purple tips.” I said. “Oh yes, Droopy Whites are very pretty and they smell wonderful too...some say they smell like fresh apples. I think they smell like apple pie with cinnamon.” Said Dublin, with a big smile, which lit up her peach colored cheeks. “So you said you are on your way to the ‘March Hare’ parade? What is that?” I asked. “Oh could I? I think you’re absolutely right! I’d love that!” I said, with great excitement. So the next thing I knew, I was dancing, singing, laughing and stuffing my mouth with the many different scones that laid out on the long clover covered tables. I ate so many...well they were the size of small crumb. I had the most wonderful time, and can’t wait till next year. I will wear my “Best, Brilliant, Green” and bring a tray orange, cranberry scones to share with all my new ‘Fairy Folk’ friends. Be sure to watch where you’re going...you may just be about to go on your way to a ‘March Hare’ parade with some tiny wee folk, who make the best scones you’ll have ever eaten!